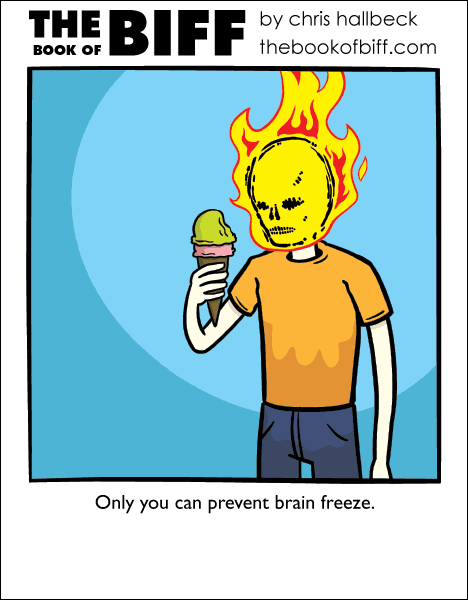 Brain freeze scared me as a kid. There was a period of time that I got it a lot. I tried to slow down and eat slowly to avoid it but give in after a few minutes and suffer the consequences. Biff looks cool with a flaming skull for a head! Biff wondered why he couldn’t actually eat any ice cream, as it kept melting whenever he would bring it up to his lips to try. Any ideas how to force it to happen? Take a bite of some ice cream and hold it directly against the roof of your mouth. I’d put just the head on a t-shirt, just to confuse people. Biff learns that his coffee-flavored ice cream is too hot.